The weather in Flagstaff has been increasingly finicky lately – some days are beautiful and sunny, while others are so cold and windy that all you want to do in snuggle deeper under your covers. Since the weather has been so unpredictable, many girls have fallen back on the campus uniform of leggings, snow boots, and NAU hoodies. However, Leyna’s style popped out in a sea of lookalikes. While still being comfortable and fashionable, multiple layers and boots gives her outfit functionality in such erratic weather. Snow boots and UGGs are the go-to shoes on campus whenever the threat of rain or snow looms near. 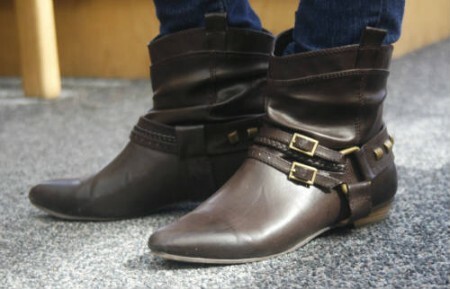 However, Leyna manages to be both trendy and practical with her brown boots. The studs and pointed toes give the boots an edgier vibe, and the leather makes them durable for all types of weather. As Leyna shows us, there are fashionable alternatives to the basic snowboot. 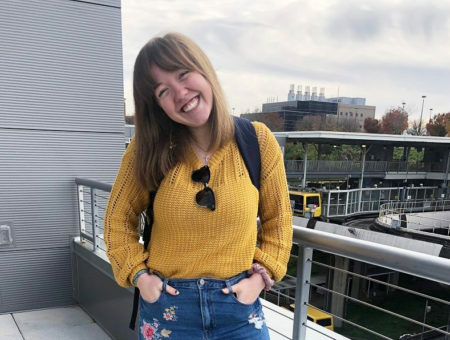 Layering is key when you’re living on a campus where it could snow at any moment and then be fifty degrees the next. Embracing the warm flannel trend, Leyna gives her simple graphic tee an updated look for winter. 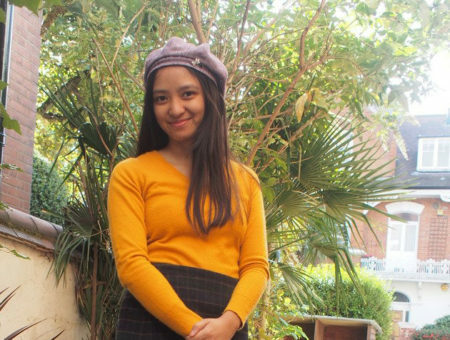 Her scarf adds to the yellow color palette of her outfit, while acting as both an accessory and a necessity for a cold day. As an avid Harry Potter fan (she even took a class at NAU about it! 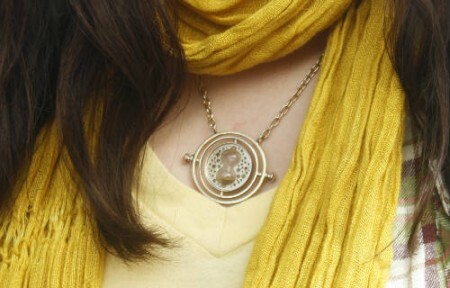 ), Leyna incorporates her love for the series into her outfit by wearing a Time Turner necklace that her boyfriend bought for her. 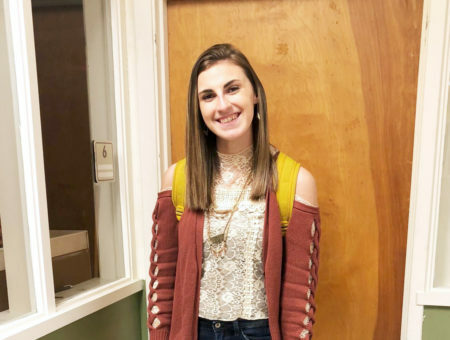 Not only does it add quirkiness to her outfit, but it’s also a one-of-a-kind necklace! 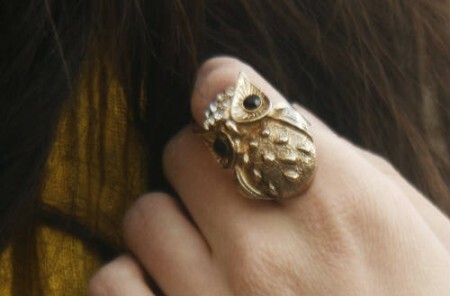 Leyna’s adorable owl ring echoes the yellow and gold hues of her outfit. It also ties into the whimsical aspect of her outfit, along with the Time Turner, giving it a very fun vibe! Do you like Leyna’s style as much as we do? What do you think of her quirky accessories? 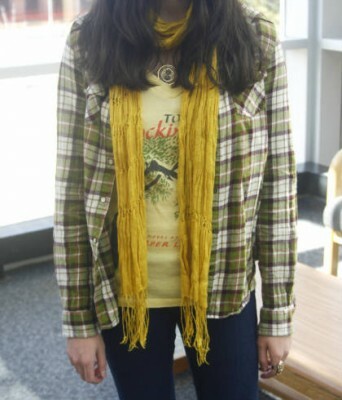 Do you like her flannel shirt and graphic tee combo? Let us know in the comments!